This week has been designated Flood Awareness Week by the National Weather Service. 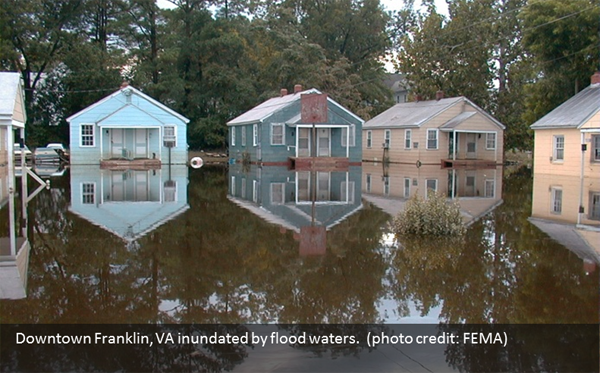 Each year flooding is responsible for the deaths of dozens of people in the United States and thousands worldwide. 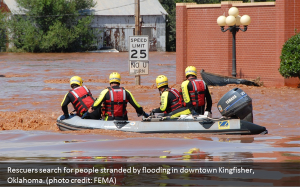 2014 was a relatively safe year in the United States because of a lack of tropical storms and hurricanes, yet 41 people were killed by flooding. We’ve all heard the phrase “Turn around, Don’t drown!” That is well-taken advice because of the 41 fatalities last year, 27 were in vehicles. Just a few inches of water can sweep a car away. Never drive into a flooded area. Even if you think you know the street or highway well, it is possible some of the pavement was washed away by the tremendous force of flood waters. Driving into water at night and during other periods of low visibility such as heavy rain is especially dangerous. We’ll talk about preparation and recovery in later posts, but this awareness week is a good time to talk about protecting lives. The 2014 fatalities were fairly evenly split between areas east and west of the Mississippi River. More males than females died and Texas’ six fatalities were the most of any state. 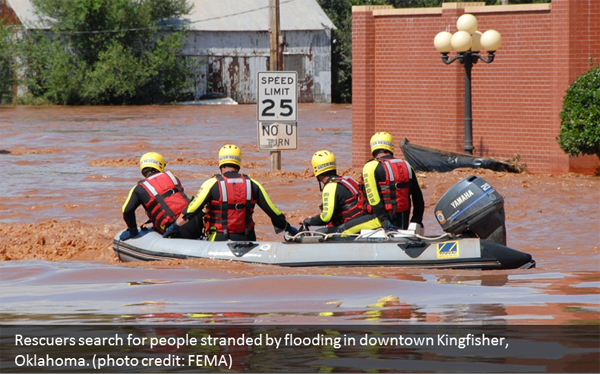 In the first two months of 2015, five people have been killed by flooding. 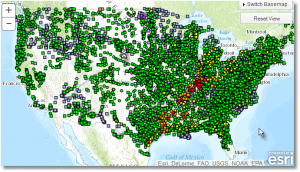 The National Weather Service has a robust flood safety web site. There are three major types of flooding…flash floods, river floods and coastal floods. All cause fatalities each year and it would be difficult to consider one more dangerous than another, although, by its very nature, flash flooding can catch its victims unaware. The National Weather Service issues advisories, watches and warnings for each of the types. During this time of year, river flooding is common and while it is usually well forecast and expected, the force of that flooding needs to be respected. River status maps such as the one below and forecast maps are available through the Weather Service. These maps are also part of a suite of tools available as part of the Next48 project of the Extension Disaster Education Network which was created by Tom Priddy and colleagues at the University of Kentucky.. You can customize the maps you want to see in your state by visiting the Next48 web site. There are also special considerations for people living downstream from known hazards such as large dams and other types of impoundments. Be aware of these threats and know how local authorities intend to issue warnings should a dangerous situation occur. There have been many tragic incidents over the years where campers and cabin dwellers have been washed away by flash flooding. Never camp in unapproved areas. It is tempting to set up camp along a river or stream. If you do, be aware of weather upstream that might cause a rapid rise in water levels. Have an exit strategy. Plan how to get to higher ground in a hurry. If authorities order an urgent evacuation, leave your belongings behind and leave immediately. Floods are a known and common threat. With a little common sense and advance planning, you can avoid becoming a number in the 2015 statistics.